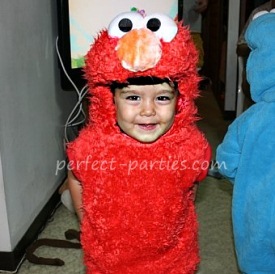 Elmo and Cookie Monster are favorite characters from Sesame Street and are a wonderful theme for a party. Perfect for toddlers and preschoolers. Here are some suggestions to find online party items from some of the most complete party stores. Color scheme is usually red for Elmo. Primary colors like yellow or orange complement this nicely. Elmo themed or red napkins, plates, cups, and cutlery. Elmo or Cookie Monster posters or birthday banners. Sand buckets decorated and filled with goodies for favors. Red, Yellow, Blue bowls for small snacks. 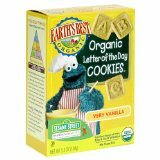 These cookies are from Earth's Best and kids love them. Cookies especially if Cookie Monster is a favorite. Pizza (Elmo's favorite food) Cut into strips for young toddlers. If this is a young toddler group you probably want to select only 1 or 2 simple games or activities. Add buttons, silk flowers or rhinestones. These letters are from Paper Source Crafts Click on photo for how to. 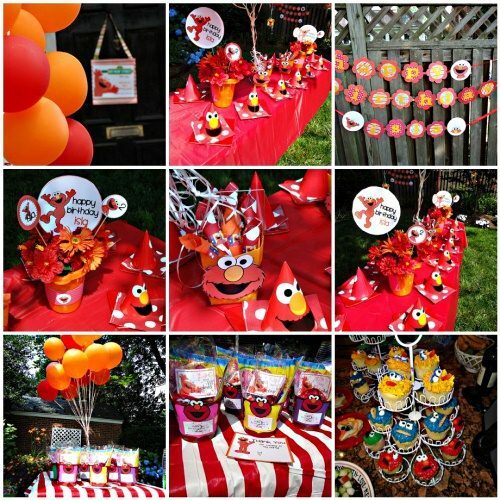 Use this ideas with Elmo Cake toppers. Water Globe Click on link or photo for complete directions. Fill a clear jar with either cookies or Goldfish (Dorothy) and have children guess how many there are. The closest to the correct number is the winner.